Welcome to the Speleotrove website: an accumulation of web pages, documents, and software. Speleology Speleogroup; LED caving light designs, caving expedition logs, and other speleological projects (these are on the Speleogroup.org website). See the 2018 expedition log for the latest trip report, and Mexico 1978/79 for our new transcription of an early trip to Mexican caves in Cuetzalan and Chiapas (and a climb up Popocatépetl). Forcau ’76; the report of the Oxford expedition to the Pozo de Vega el Forcau (OUCC proceedings 8, 1976, also available as HTML pages). My first peer-reviewed paper: The Characteristics and Use of Lead-Acid Cap Lamps, Cowlishaw, M. F., Trans. British Cave Research Association, Vol. 1. No. 4. pp199–214., December, 1974. Summary: It was 1885 when the first portable rechargeable lamp was invented. The lead-acid cap lamp we know today has evolved in the ninety years since then, and has a high capacity together with many other advantages. This paper describes the construction and characteristics of these lamps, and discusses possible modifications, the use, and the maintenance of the most common types of lead-acid cap lamps. OmniBUSS 5, The Journal of Birmingham University Speleological Society, Number 5, February 1974. Includes Expedition 1973, Picos de Europa, the first Speleogroup expedition. MapGazer is a new application for viewing offline maps (maps stored on disk) on a Windows personal computer (PC, laptop, or tablet, running Windows 7 or later). It is especially useful when the device in use has an unreliable (or no) internet connection. It is intended to be fast and simple to use, and to allow uncluttered viewing and comparison of one or more maps. Maps for MapGazer is small collection of sample maps for use with MapGazer. See Getting maps for information on creating your own offline maps. PanGazer is a new (2018) application for viewing images and panoramas, including 360° spherical and hemispherical panoramas as captured by drones. PanGazer runs on a Windows personal computer (PC, laptop, or tablet, running Windows 7 or later). It is intended to be fast and simple to use, and to allow uncluttered viewing and comparison of one or more views of images and panoramas, and also allows saving any view. Photo Gallery: a small selection of panoramas and stereo (3D) photographs of mine. Computing General Decimal Arithmetic: algorism for computers (and people) — an extensive collection of documents, links, and software for decimal arithmetic. Tollos; a small supervisor program for microcontrollers using ARM Cortex M3 cores. It is intended to provide an efficient platform for low power applications, suitable for development boards and microcontrollers from multiple vendors. It is written entirely in C, and supports a number of peripherals, including graphics LCDs such as the DOGXL. Fundamental requirements for picture presentation, Cowlishaw, M. F., Proc. Society for Information Display, Volume 26, No. 2 (1985). Abstract: “How many bits per picture element does a display need?” For the display resolutions now commonly in use, only 4 bits per picture element (pel) are needed for the display of monochrome images. A total of 8 bits per pel are needed for color images. These conclusions are based both on experiment and on the theoretical model of the visual system in which the detectors in the eye are treated as simple photon-detectors. The results are applicable to “natural” images and also to computer generated images. A particular 8-bit color encoding scheme is described that also has the advantage that natural images are displayable on monochrome displays. The Acorn 6502 Microcomputer Kit; a little piece of computer history—Acorn Computer’s first public offering, the Acorn Microcomputer (later known as the Acorn System 1). The one pictured on these pages was shipped on 9 April 1979. Also here is an Emulator for the computer, so you can try it for yourself even if you don't have the original hardware. It might also be useful as an educational resource, too, as it really shows how to program a computer at the hardware level (and with the mini-debugger you can watch the registers and other internal state changing as instructions are executed). MemoWiki documentation snapshot. MemoWiki is a simple Wiki intended for personal documentation, research, and small-scale collaboration. It allows the viewing, editing, and maintenance of a collection of pages using just a web browser. To make it easy to support research, MemoWiki integrates its pages with academic references (which can be edited just as easily) and other files (such as papers, programs, and images). IEEE 754-2008 errata. I am the Editor of the IEEE Standard for Floating-Point Arithmetic (IEEE 754). The current version was published in August 2008 and was later approved as the international standard ISO/IEC/IEEE 60559:2011. Since 2008, some minor problems have been noticed; this page lists those that I am aware of, with suggested corrections. The Standard is currently under revision and is starting the ballot process in late 2018. NetRexx 2. Introduction, overview, and definition of the NetRexx programming language, version 2. From the Introduction: NetRexx is a general-purpose programming language inspired by two very different programming languages, Rexx and Java™. It is designed for people, not computers. In this respect it follows Rexx closely, with many of the concepts and most of the syntax taken directly from Rexx or its object-oriented version, Object Rexx. From Java it derives static typing, binary arithmetic, the object model, and exception handling. The resulting language not only provides the scripting capabilities and decimal arithmetic of Rexx, but also seamlessly extends to large application development with fast binary arithmetic. NetRexx is now open source, maintained and enhanced by the Rexx Language association at the netrexx.org website. If you already know Java then Leonardo Boselli’s NetRexx at Once is a good starting point. The Preface from The NetRexx Language, M. F. Cowlishaw, ISBN 0-13-806332-X, Prentice-Hall, 1997. Some open source NetRexx code (the BigDecimal prototype class). REXX is a programming language I created and implemented from 1979–1982. On this site is a REXX Language History collection, including a summary of its background philosophies, and also some REXX programs I have written. The primary resources for REXX, along with historical links etc., are on the Rexx Language Association website. There is also a list of available REXX papers, etc., supervised by Prof. Rony G. Flatscher at WU Vienna (select ‘Rexx’ in the keyword list). RexxCPS (Rexx Clauses Per Second); a list of RexxCPS results, showing the number of Rexx clauses per second observed on various combinations of hardware and operating systems since 1989. LEXX is a text editor that I wrote while on secondment to the Oxford University Press in 1985, for editing the Oxford English Dictionary. It was probably the first syntax-driven colour text editor. This LEXX-screenshots.zip file contains original 1986 front-of-screen shots of editing an OED entry (bungler), and also a number of later screen captures showing the use of LEXX for a variety of applications (including its own tutorial). LEXX is still available from VM Download Packages page. The IBM Jargon and General Computing Dictionary is a lexicon that I compiled for ten editions from 1980 through 1990; it is a dictionary that is "intended both to inform and to entertain; each entry has a definition, which is usually supplemented by an explanation and an example of usage". Bob Comlay has kindly allowed me to link to his copy of the dictionary. Aviation Flying weather analyses: some experimental analyses of UK weather for 13 weather stations since 1997, with particular emphasis on wind strengths and Visual Flight Rules. Experimental avionics: a description of some simple avionics applications I have written, implemented on a battery-powered device and using GPS and/or accelerometers. 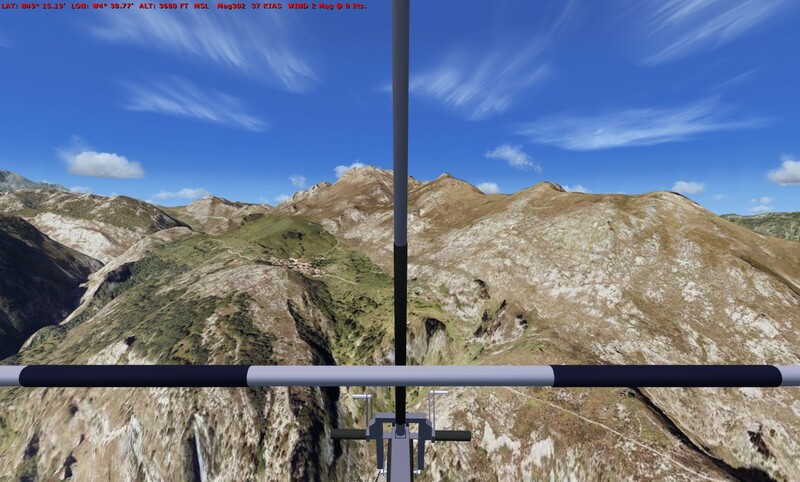 The Flylight MotorFloater for FSX: my model of my MotorFloater Single-Seat Deregulated (SSDR) aircraft for Flight Simulator X. Here’s a screenshot: approaching Tresviso, over the Picos de Europa. British Microlight Aircraft Association Flight Training Vouchers: as a Microlight Pilot, I’d like to encourage others to give it a try; through the BMAA you can buy a microlight flying lesson and start your training towards becoming a Microlight Pilot, or you can purchase a voucher for someone else as a gift. The Sirocco Microlight: a collection of information on the Sirocco Microlight, a single-seat ultralight aircraft which has a pusher propeller, tricycle undercarriage, and 3-axis flight controls. Includes a description and history, several articles and other references, and some links to images and videos – including the new Sirocket. The Spratt Controlwing Flying Boat—plans and construction notes. George G. Spratt's Controlwing flying boat was developed from 1939, with plans drawn up in 1972–1973. Bill Wolfe used these drawings to build N107GW in the late 1990s, and this page includes his annotated plans and an 84-page manual. Long Marston R22 overhead join and circuits: an image showing flight tracks from a training session on 2008.10.29, departing to and returning from Shotteswell airstrip. Other El Mazuco (the impossible defence); my translation of El Mazuco (La defensa imposible) by Juan Antonio de Blas, a chapter in La guerra civil en Asturias. Home Educating Our Autistic Spectrum Children: Paths are Made by Walking; Edited by Terri Dowty and Kitt Cowlishaw (JKP 2001). How to make SMT boards at home: pictorial showing the steps needed and a novel SMD component holder (also available at SpeleoGroup). An Electricity Kit I built for my son in 1994. Mark Cowlishaw's RS-flip-flop board, designed and built in 2003. Brandy Butter ‘ancestral’ Cowlishaw recipe (also for Rum Butter). Wallace Breem (1926–1990) was a British librarian and author, and was the Librarian and Keeper of Manuscripts of the Inner Temple Library at his death in 1990. He was perhaps most widely known for his historical novels, including the classic Eagle in the Snow (1970). This site was constructed and is maintained by Mike Cowlishaw. Please send me any corrections, suggestions for improvement, etc. All text and images Copyright © Mike Cowlishaw 1973, 2015 except where stated otherwise. All rights reserved.